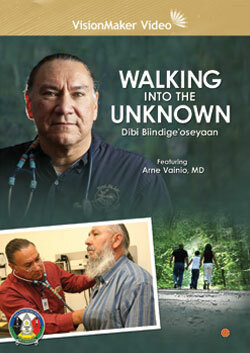 Walking Into The Unknown follows the personal journey of an American Indian physician, Dr. Arne Vainio, who turns 50 and realizes his own health is in jeopardy and he is not following the advice he gives his middle-aged male patients. Facing all of the health risk statistics for diabetes, heart disease, stroke, cancer, and etc., that many American Indians face, he chooses to address his risks by undergoing the medical screenings, diet changes and lifestyle necessary to override the fatal outcome many experience. He takes the viewers with him every step of the way on this intimate and fascinating walk into the unknown. As the doctor reverses roles and becomes the patient. The result is a poignant story of vulnerability and personal revelation that inspires and educates viewers.